I was at Wal-mart the other day and I was looking for a jar type container to store some ribbon in. I wanted to be able to see through the containers. So needless to say, I couldn't find what I wanted but I refused to go home empty handed. I was walking through an isle that had kitchen stuff in it and I saw these containers. They are tin with a see through top that comes off. The best part is that the bottom is magnetic. 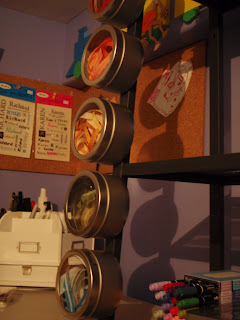 Now with me being someone who takes all my stamping stuff out and leaves it all over my desk, then I can't find anything.......these containers work great for me. My shelving is metal so the tins stick right to the shelves. Very cool! 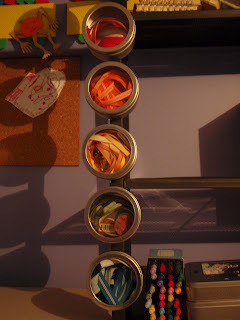 In each container, I put my smaller pieces of ribbons that I didn't want to throw away but didn't really have a place to put them either. Each tin was for a different colour . Each tin was $4.27 . They had smaller ones too.